In a nice match with 12.000 supporters in Stadium Luigi Ferraris, that was influenced by the decisions of referee Banti, Genoa did win the Tropheo Spagnolo: 3-1 against AZ Alkmaar. Genoa started with Rubinho; Potenza, Ferrari, Biava; Mesto, Milanetto, Juric, Modesto; Sculli, Figueroa and Palladino. In the 2nd minute Brett Holman scored the opening-goal while the whole defence of Genoa not was awake yet. After this goal Genoa was the best team in the field, but AZ stayed dangerous with a ball of (again) Holman on the post. In the 35th minute Genoa was helped by referee Banti who gave both a dubious penalty to Sculli of Genoa and an undeserved second yellow, so red, card to defender Donk of AZ, that had to play the last 55 minutes with 10 players. Figueroa realized the penalty, so at halftime the score was 1-1. After 5 minutes in the second half Mr. Gasperini brought Rossi, Gasbarroni and Rubèn Olivera in the field and within a few minutes Olivera headed a fantastic cross of Gasbarroni behind goalkeeper Didulica of AZ. In the 76th minute the match was decided by again Olivera who scored the 3rd goal after a wonderfull combination of Di Gennaro and Gasbarroni. A few minutes later also AZ got a penalty of referee Banti but Rubinho stopped the shot of Ari. After the match the parents of murdered Vincenzo Claudio Spagnolo hand over the trophy to captain Marco Rossi. This match to remember the murdered Genoa-supporter Vincenzo Claudio Spagnolo can be a very spectacular one. The teams are both on the way back to the top after National titles and great European adventures in the Uefa-cup in the past. Since several years AZ plays the most attractive football in Holland. The money of their President Dirk Scheringa and the choice of traditional Ajax-coaches Adriaanse and Van Gaal brought offensive and succesfull football in Alkmaar. Unless the fact that AZ has the most players of all teams in the world on the Olympic Games in China (2 with Holland, 3 with Belgium and 1 with Argentina) and their striker Graziano Pellè is injured they still can bring a young and very attractive team in the field. Their leaders are Dutch international Demy de Zeeuw who played this summer with Holland on the European Championships in Austria and Switzerland and former international Stijn Schaars who returned after a heavy injury. Since the arrival in the summer of 2002 of former Ajax-coach Co Adriaanse everything changed in the city of cheese: Alkmaar. In the past AZ with Jan Peters did win it’s only Dutch title (in 1981), 3 Dutch Cups (1978, 1981, 1982) and reached the Uefa-cup final in 1982 against Ipwisch Town, which they lost by 0-3 in England and a 4-2 victory in the Olympic Stadium of Amsterdam. In the summer of 1982 Jan Peters and several other players left the club to play outside Holland and AZ fell down. Since the return of Adriaanse, AZ is back on the Dutch top. After many years at the bottom of the standings and also 9 years in the first division of Holland, Adriaanse reached the 5th place with AZ in the season 2003-2004 and the 3rd place and the semi-finals of Uefa-cup in the season 2004-2005. In the summer of 2005 Adriaanse was changed by the famous ex-Ajax, Barcelona and Dutch National team trainer Louis van Gaal, who married last Friday in Portugal. With him AZ reached the 2nd place in the Dutch league in the season 2005-2006 and the 3rd place in the season 2006-2007, while they still were on the first place after 33 of the 34 matches. In the last match AZ could not stand the nerves and PSV and Ajax passed them in the standings. In the summer of 2007 AZ changed their topscorers Koevermans and Arveladze into Ari and Pellè (Lecce) which was not a good decision because last season AZ ended on the 11th place in the Dutch League. Genoa misses 4 players tomorrow: the 3 Olympic players: Bocchetti, Criscito and Vanden Borre and the injured Matteo Paro. The rumours in the newspapers say that the near future of Lucho Figueroa will be decided after the match, which should be very unfair after 2 years of injury and only a few minutes in the friendly matches this season. Within 20 hours Genoa played 3 friendly matches. Genoa should start the mini-tournament with matches of 45 minutes in Alessandria against Larissa (Greece Serie A), but the official documents of the Greece team failed, so the referee did not want to start the match. 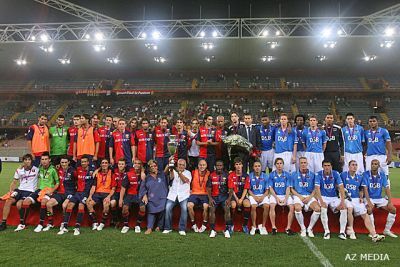 Half an hour later Genoa opened the tournament against the hometeam Alessandria (Serie C-2). With a goal of Biava in the 8th minute the Gasperini-boys did win the opening-match. 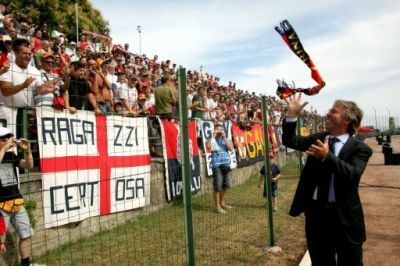 Directly after this game Genoa had to play against Larissa that in the meanwhile resolved the administrative problems. Maybe because of the combination of the high temperature and the fact that it was the first match of Larissa and the second of Genoa, the Greece team did win the match by 2-0, which meant the first defeat of Genoa this summer after 5 victories (18-1, 4-0, 1-0, 8-0 and 1-0). This afternoon the Grifoni played their third match within 20 hours against Derthona (Serie D). This match was especially organized to give the 2 last arrivals: Sokratis Papastathopoulos (who prefers that we name him Sokratis) and Matteo Ferrari 90 minutes playtime before their first homematch against AZ Alkmaar next Wednesday. 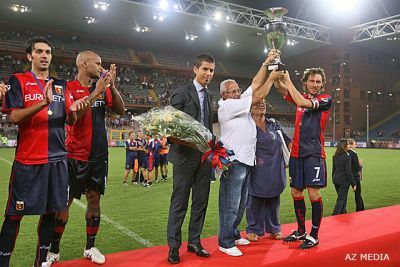 Genoa did win the match by 5-0 with goals of Gasbarroni (2x), Di Vaio, Olivera and Palladino. Yesterday-evening Genoa has beaten Acqui Terme by 8-0. Luciano Figueroa played his first match and scored his first goal. Raffaele Palladino and Rubén Olivera both scored twice, while Biava, Di Vaio and youngster D’Alessandro scored the other goals. Before the match Matteo Ferrari, who played already 204 matches in Serie A, signed his contract for the next 3 years, while today Sokratis Papastathopoulos arrived in Genova to have his medical test and afterwards he signed his agreement. Next Saturday Genoa plays in Alessandria a mini-tournament with matches of 45 minutes against the local team that plays in Serie C-2 and the team of the Serie A of Greece: Larissa. Wednesday 13th August the team of Mr. Gasperini plays against AZ Alkmaar to win the Tropheo Claudio Spagnolo. Our new technical director, Mr. Rino Foschi did it again. After Sokratis Papastathopolous he again bought a central defender to please Mr. Gasperini. Matteo Ferrari is 28 years old and arrives from A.S. Roma where his contract ended this summer. A lot of teams in Europe wanted the experienced defender that already played 11 matches in the Italian national team, but Matteo decided to stay in Italy and to return with the club he already played for in the season 1997-1998 at the beginning of his career. Enrico Preziosi did it again! Our 14th new arrival was wanted by Ajax, Inter and several other big teams in Europe, but the young Greek international chose Genoa. Yesterday-evening at 21.30 hours the 20 years old Sokratis Papastathopoulos (1.83 high by 82 kilo’s) signed his 5 years contract and he arrives in Genova – to have his medical test – next Wednesday after which he goes to Acqui Terme to meet Mr. Gasperini and his new teammates that beat him yesterday by 1-0. In Greece they say he is the best Greek defender of the last 20 years and unless his age he already plays in the national team. At the end of the 2 weeks of training in Austria, Genoa played a friendly match against AEK Athens the team of Rivaldo and Papastathopoulos one of the most wanted young defenders of Europe. In the first half Giuseppe Sculli was close to the opening-goal, but he headed the ball against the crossbar. In the second half after 15 minutes Davide di Gennaro scored a wonderful goal after a great combination with Gasbarroni. In the rest of the match that was live on the internet (thanks Justin TV !!) the advantage of Genoa never was in danger thanks to Alessio Scarpi and the young defender Matteo D’Alessandro. Tonight Genoa flies back from Innsbruck to Genova for a little break of 2 days. Monday starts a new session of 2 trainingsweeks in Acqui Terme (Piemonte).